^ Gambian president's claim of AIDS cure causes alarm, USA Today, 20 February 2007. ^ Dibba, L. M., Jammeh starts curing HIV/AIDS patients today, The Daily Observer (Banjul), 18 January 2007. 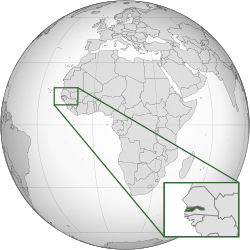 "The Gambia". The World Factbook. Central Intelligence Agency.